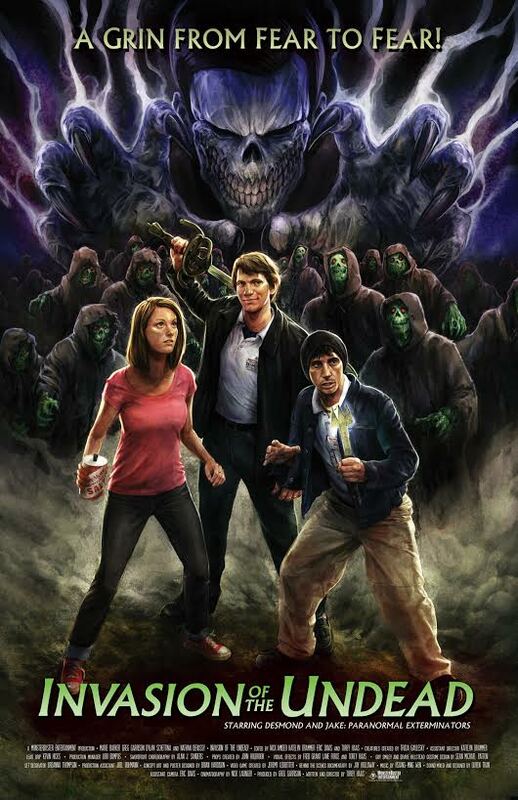 Available now on demand is the chaotic looking monster romp from the indie production company MonsterBuster Entertainment, INVASION OF THE UNDEAD. The film comes our way from filmmaker Torey Haas and will remind you of all the classic creature features from the glory days. Well the film is now available on demand and we have an awesome clip for you to see from the film. Enjoy it with the original trailer and also the trailer from the 16 bit video based off the film that will be out on March 13th! Invasion of the Undead, the first feature film from independent production company MonsterBuster Entertainment, is now available to rent and purchase digitally on Vimeo On Demand (http://www.vimeo.com/ondemand/Invasion), with more digital outlets to follow shortly. An 80’s-style horror comedy in the vein of The Evil Dead and Big Trouble in Little China, this ambitious $17,000 film recently had a series of successful theatrical screenings in Atlanta, including a sold out premiere at the historic Plaza Theatre. The Invasion of the Undead 16 bit-style video game, previously slated to release alongside the digital premiere today, will now debut on Friday, March 13th. An updated trailer for the game can be seen below. It will be free to play inside of a browser. Partially funded by Indiegogo, Invasion follows Allison, a young woman who gets more than she bargained for when she enlists the aid of two freelance paranormal exterminators to combat an undead infestation in her new home. It is the first film in a planned four-part series and the cornerstone of a MonsterBuster Cinematic Universe in which characters from past and present MonsterBuster productions will cross paths as the series progresses- think a horror version of Marvel or Star Wars.